Cleaning the yard is something very few of us enjoy, and it can certainly be quite challenging for the common man. However, sometimes, we have no choice but to buck up and clean it up, especially when the folks and friends come to visit. Finding the right gardening tools to clean up the yeard effectively makes the entire process even for dreadful—what with the vast selection of tools you can find with just a quick search online. One such tool that is essential for this kind of task is the rake. If you are trying to find a rake to add to your arsenal of gardening tools, we have got you all covered. Here, we will take an in-depth look at a rake that is taking the gardening world by storm—the Rake Assassin by Root Assassin. Root Assassin, LLC was founded in 2014 for the purpose of bringing in unique and efficient gardening tools for everyone. Each product that this company designs and manufactures is backed by extensive research and approved by professional landscapers, garden hobbyists, irrigation industries, and of course, the weekend warriors. With every gardening tool that Root Assassin offers comes just the right amount of style, quality, utility, durability, ergonomics, and most importantly, affordability. One of their proud creations is the Rake Assassin. Curious as to how this rake stands out from the rest? Let’s find out. What sets the Rake Assassin apart is the fact that it doesn’t bend or break easily. It has a body that is made of heavy-duty yet lightweight aluminum material that is powder-coated. In addition, it also features a plastic D-handle that allows for a firm yet comfortable grip. Compared to other rakes that can only scoop up a small number of leaves and bends just after a couple of months’ use, the Rake Assassin guarantees that you will get the most value out of your investment. It does not matter what the outdoor task is. With the Rake Assassin in your hand, you are guaranteed to accomplish it with absolute ease. The Rake Assassin ensures that you spend only half the time you would spend using a regular rake. This rake will allow you to easily remove leaves, grass, pruning clippings, tree waste and so on. The Rake Assassin comes with a handle that is designed by the gardening industry’s experts. This handle, with its ergonomic design, reduces fatigue and allows you to rake for long periods. In addition, the body is also made up of two sections, which you can take apart for hassle-free storage and transportation. Unlike cheaper rake handles that tend to dig into the hands, no matter if they are made of wood or plastic, this will never occur with the Rake Assassin. Furthermore, this rake is not even prone to issues like rusting or chipping like the average metal rake handle. The Rake Assassin is more than just a rake. It features a unique technology that will make the cleaning and raking process an absolute breeze. The pole has a bend in the bottom half that will allow rolling the handle in order to convert the whole rake into a shovel. Hence, with this rake, you will be able to draw piles and piles of waste and leaves and then be able to scoop it up easily with just one simple hand motion. So, you will not need to use plastic or an additional rake. In addition, the Rake Assassin is also a great choice if you want to skim your swimming pool. Root Assassin as a company is well known for their high-quality products. So, the company ensures that their Rake Assassin lives up to the same high standard. They have ensured that this product has met the highest level of excellence in order to keep their customers content. Furthermore, if you are looking for a proper holder for the Rake Assassin, they also separately sell a garden tool holder. Now, wouldn’t that look great in your shed? The Rake Assassin is an ultimate solution to gather all fallen fruits, nuts, clearing pine cones, chestnuts, and even rocks. You can also use this rake if you want to spread mulch or compost all over your lawn as well as between the plants. 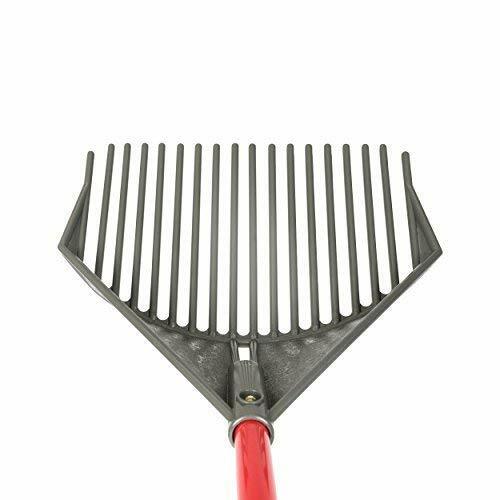 If you are an animal lover, then this rake is ideal for you as it will help you clean the stable, or even just clean up after your pet without having the need to bend down constantly. This ultra long shovel and rake combination is a perfect addition and a must-have gardening tool for everyone. The Root Assassin’s Rake Assassin is one of a kind, making it very difficult to compare it with another product of a similar kind. The closest rake we found that we could compare it to was the Corona RK 62060 Fixed Tine Shrub Rake. It is evident that the two products are not exactly the same. However, they are sort of similar. Let’s compare these two products briefly. While the Corona rake is also quite popular among consumers, this rake is not as durable as the Rake Assassin. The only similar aspect they have is their length. The Corona Shrub Rake is known to get bent over time and use. What makes the Corona Shrub Rake the clear inferior is the fact that it cannot function as a shovel like the Rake Assassin can. In addition, it is also made from standard materials, which makes it last only for a couple of weeks or a few months tops. The Root Assassin's Rake Assassin is a one of a kind garden tool that is something you will truly enjoy. This combination of shovel and rake will cut down the work time by half. With its heavy-duty build, it will also last you for a very long time thanks to the high-quality materials used to manufacture it.